Comfort food in a hurry and at a budget. Dinner in 5 minutes at home beats eating yet another fast food burger. 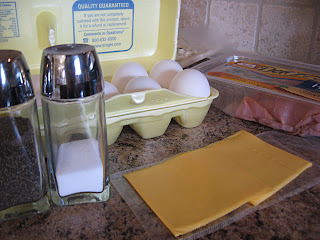 American cheese slices – I think I used 2 for 5 eggs. That made it plenty cheesy for me. Scramble the eggs and toss them in the skillet. 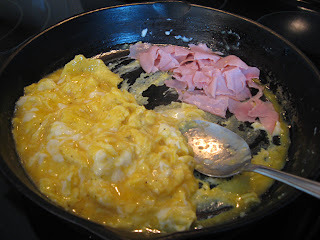 After they’ve cooked a few minutes add the ham pieces, letting them get hot in the skillet, then stir them into the eggs. 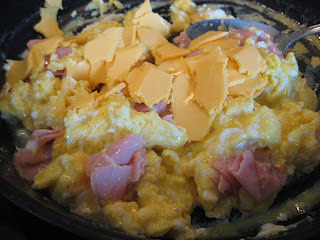 Toss in the cheese pieces when the eggs are just about done cooking. The cheese will melt into the eggs quickly. Serve with toast or biscuits. Love eggs on the weekends. I use sharp shredded cheddar. YUM! It’s official – I’m Hungry! We love eggs and ham, too. For a different flavor, I sometimes use Parmesan and sub Canadian Bacon for the ham. My husband likes to add a splash of orange juice to the eggs while they are cooking. It just adds a tangy touch. My mom made this for me all the time! Awesome recipe, thanks for reminding me of it. hmmm…i just might be making this this week now. 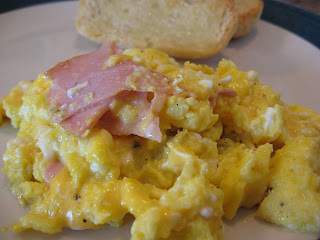 i love eggs and ham and cheese! yum! The more I look into eating cheap, the more I’m loving the idea. Delicious meals that are wallet-friendly, what more could I ask for! Is anyone else getting horrible chills down there spine looking at the metal spoon in the skillet??? ?